Yes, I Think It’s Too Soon For You To Date. I have been single now for just shy of 6 years. Single for me means that I haven’t even gone on a single date. Well, there was one outing, and I thought I was pretty clear up front about how it ABSOLUTELY was NOT a date. Apparently the words “just to be clear, this is absolutely not a date” were confusing, because this dude totally thought it was a date. I did kiss that one guy at a hotel in California, but that’s been the most “action” I’ve seen since becoming “un-engaged”. My engagement ended 6 years ago in a giant ball of fiery glory, so you can imagine I wasn’t horribly eager to jump into another so soon…and it took a long time for me to properly heal my broken heart and find who I was. At first, it was not a conscious choice for me to not date, as I think men can smell fear and desperation and I tried really hard. Then I realized that I needed to find myself, to get to know who I was so when (if that is God’s plan) some gentleman decides he wants to pair up with me, I don’t change who I am to please that man. Lately, I have been so busy doing other things, that I haven’t had the time/effort/bandwidth/desire to date at all. But that’s not the case for every single parent I know. Through social media, I have watched a lot of my friends uncouple and couple back up before I realize what’s happening. You have seen the scenario, where they suddenly stop talking about their husband/wife/partner and then their profile photo changes to one of them kissing someone who is obviously not the same person they were coupled to before. And it’s usually pretty fast. And it usually falls apart pretty quickly too. I do have a lot of friends message me shortly after a breakup to ask me if I think it’s too soon for them to start dating again. My answer is always “yes”. You need to be by yourself for a little bit, especially after you’ve been married for 20+ years and don’t really know adulthood outside of being hitched to another person. Even if it’s just to breathe, find out what it’s like to sleep in the bed alone and figure out who you are when you’re not seen through the lens of your now-ex-husband/wife/partner. You have to be YOU for a while before you run off again to be a “we”. When you’re recovering from a breakup, that can take some time. ESPECIALLY if you were in the relationship for a long time. People are so anxious to hook back up with someone because they’re uncomfortable being alone, I TOTALLY GET IT. I have had days where it’s hard for me to admit that I’m single. It’s hard to sit by myself at the movie theatre, or walk down the street alone or really go anywhere by myself sometimes. But I’m doing it. I spent a lot of time shedding the labels I let my boyfriends or my teachers or my friends put on me so I could figure out who I really was, and I could not have done that while I was dating other people. So yes, I think it’s too soon for you to date, just months after your relationship has dissolved. You will know when it’s right, but please do not try and convince yourself that you are ready when you are not. When your life completely disintegrates before your eyes, it’s astounding. Like that ending scene from Fight Club with the explosions. Everything burns to the ground. I remember the day after my last breakup, I had been crying for about 24 hours. My face was so swollen, I was barely recognizable. I had just gotten a mustache tattoo on my middle finger and was showing anyone who held still long enough. 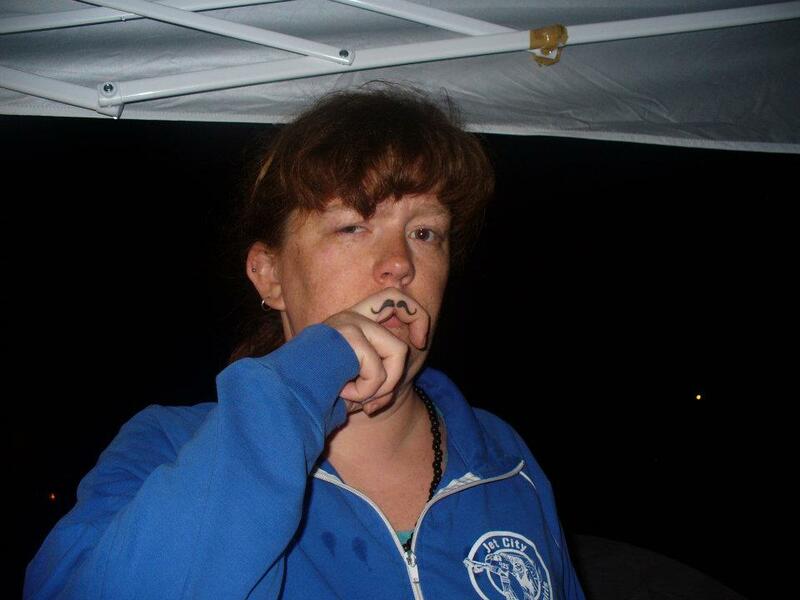 It was the middle of the night, I was without my children, sleeping in a tent on the library lawn in our town (it was an event, not me just randomly camping in a public square) and in that photo, you can see the teardrops on my jacket clear as day. Let’s not talk about my ill-begotten bangs. Ahem. But I remember standing in the middle of all of these lit luminaria bags, watching them burn as my life also burned down around me. It was the first time I had felt at peace, and the first time I felt like everything was going to be better. I didn’t feel that way again for a long time. When it came time to sift through the ashes of my life, I found that some of my friends had burned away too. They weren’t answering messages or phone calls and on several memorable occasions, a few of them ran away from me in public or cut short conversations when I managed to corner them. But I can’t blame them for leaving. My life was such a gaping suckhole of mucky suckitude that if I could have escaped it, I would have tried. I spread my misery far and wide and started building a huge wall around myself (we will talk about the wall another time). Everything was not awesome. It was awful. But I cannot blame those friends who wandered away for leaving. And I definitely could not chase after them. I didn’t have it in me. 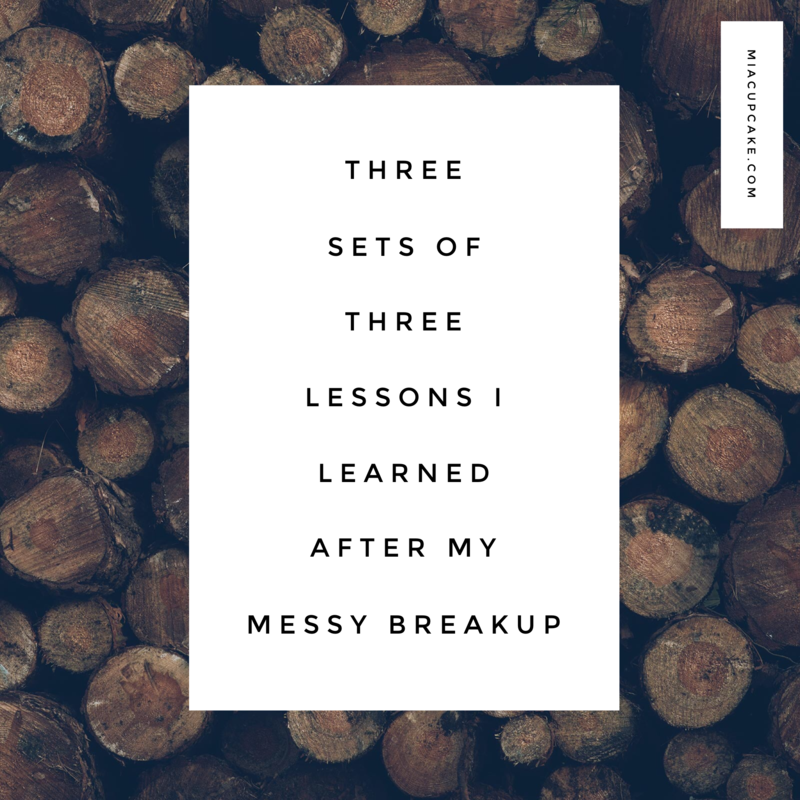 I learned a lot of things during the “breakup recovery period” (which took a really long time, but was 100% necessary). I was literally too much. Too much sad. Too needy. Too angry. There was too much of everything and it was SO BIG, and honestly it was easier for them to stay away. Some of them came back eventually. Most did not. And both are 100% ok. They were going through some stuff themselves. I watched 4 seemingly rock-solid relationships in our circles completely explode within the year after mine. 3 more dissolved within the next year. They couldn’t help me carry my load because their hands were full carrying their own. I could hardly expect someone to help me manage my sorrow and theirs simultaneously when I could/would not reciprocate. I couldn’t handle their happiness. I made everything about my sadness. Their babies were a reminder I didn’t have mine with me. Their engagement reminded me of the tiny diamond ring in the green and wood box that I returned to the giver. Their new house reminded me of the one I had to move out of (and the fact I was living in a tee-tiny apartment). I was SO ENMESHED in my misery, I was unable to help them celebrate their happiness. And understandably, they chose to celebrate rather than come into my mess. I could never guess who would go and who would stay. People who I thought would stick with me for the long haul evaporated. “Fringe friends” ran through the fire to stand with me while I cried. Some family left me behind, while people I didn’t even know stepped into the breach for me. It was a fire sale, but I couldn’t set everything (or everybody) on fire I wanted to get rid of. Some things had to be addressed. Some things had to be dug up and examined and either kept or tossed aside. Some people seemed like they had good intentions in helping, but they actually just fed off the drama I was constantly mired in. Nobody else can drag you up out of the muck and the mire unless you start moving that way yourself. Have you ever tried to get up off the floor while you’re wearing a heavy backpack? And people try to help you stand up, but unless you’re working in the same direction, there’s no chance you’re going to get up. You have to take care of yourself. I did an amazing job taking care of my children. They were fed. They did their homework. They had things to play with and we went out on outings. But I did not take care of myself for about 9 months. I wore myself down really hard and it took double pneumonia (with no sick time at my new job!) to slow me down and wake me up. Do not recommend that course of action. You have to see other people. I’m not talking about dating. I’m not even talking about talking to other people. But when you are in the middle of a giant pile of muck, isolating is one of the worst things to do. I would go to the grocery store just to be among other breathing people. I would buy like 2 apples and a loaf of bread, but wander around for an hour. Petting dogs is also a good thing, if dogs are your thing. Soft dogs are the best. You have to nourish yourself. That could mean going to church and nourishing your soul. That could be eating whole foods instead of fast food. It could be yoga instead of sitting endlessly on your couch. It wasn’t easy to come back, and it wasn’t easy to watch some of my friends walk away. But it was absolutely necessary for me to be able, through trial and error and joy and pain and all this crazy, to find out exactly who I am.